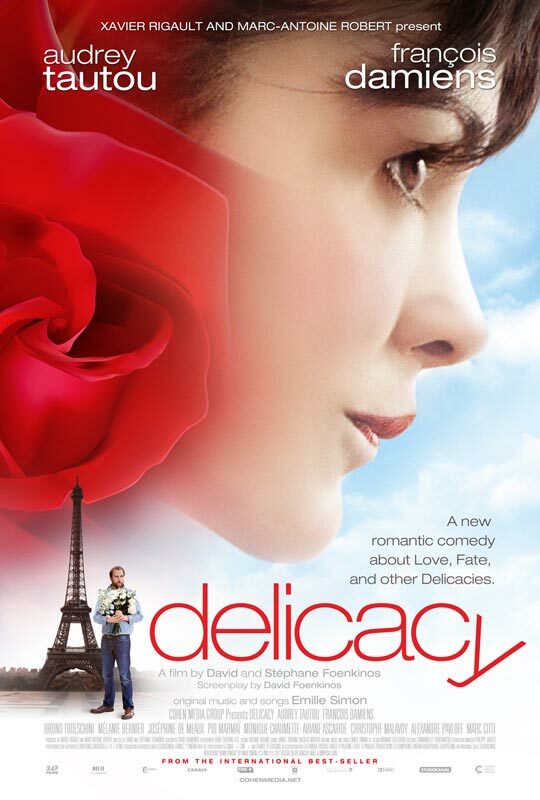 David and Stéphane Foenkinos’ first feature, DELICACY (La Délicatesse), is French, stars Audrey Tautou and bears the tagline, “a new romantic comedy about Love, Fate and other delicacies.” In other words, the expectation of a quirky, artful AMÉLIE knockoff would be reasonable. It would also be a gross over-estimation. Part romantic farce and part workplace comedy, the film is airy and big-hearted, with enough Parisian flavor and European presence to satisfy film-going Francophiles, but that’s about as far as it goes. Were it not for the unforeseen intervention of a careless motorist, DELICACY could have been the shortest romantic comedy ever. As it stands, shortly into domestic bliss, an anonymous lead-foot squashes protagonist Natalie’s (Tautou) true love and husband, Francois (Pio Marmaï). One “Three Years Later” later, Natalie’s a high-paid executive who has channeled her grief into her occupation, and remains alone save for constant unwanted advances from her manipulative boss, Charles (Bruno Todeschini). 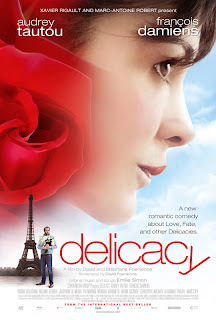 When she’s put in charge of her own staff, however, she meets an unlikely love interest – a paunchy, balding Swede named Markus (François Damiens). It’s hard to pin down exactly what writer/co-director David Foenkinos is trying to say, other than that love can be found at unexpected times and in the most gap-toothed of places. A consummate professional and experienced widow, Natalie isn’t expecting to find a lover - certainly not one twice her weight who reports to her. Meanwhile, Markus, a self-effacing bachelor with neither delusions nor shame about his unremarkable physique, seems so accustomed to rejection that he’d just as soon abandon the relationship early on lest it fall apart on its own for reasons beyond his control. One of the more frustrating aspects of the film is its sustained lack of engagement with Natalie’s grief. There’s a hearty 15-minute chunk at the start showing her and Francois in action, meeting and wedding and enjoying their lives together, but then, after leaping three whole years ahead, we meet a Natalie who’s absorbed with her work, but otherwise emotionally functional. If the movie has larger ideas about human resilience or the transmutability of love, they’re obscured by the office chatter and Markus’ self-defeatist moping Of all the obstacles standing between ultimate happiness with the Swede – their work situation, the jealous boss, her superficial friends and Markus’ persistent hangdog emo-tude – her street pizza’ed hubby seems to have the least defined influence (except, of course, during a couple volatile emotional scenes where his name is surreptitiously dropped almost, it seems, to simply wrench one-more turn from the tuning pegs of the audience’s heartstrings). I can see how perhaps the early portrayal of Natalie and Francois as a couple aids in helping us see Natalie at her best – to reveal her true potential for happiness and supply weight to the lingering ghost that may (or may not) be contributing to ger romantic reticence – but the narrative distance the film puts between Natalie’s tragedy and her unlikely and humorously tumultuous office romance makes the entire widow storyline feel like simple artificial drama - a stone of false pathos tied to an otherwise frothy and wholly serviceable romantic comedy.